Even though I've been blogging for 4 years, posing in front of camera is still not comfortable for me, because I was always behind the camera, mainly focusing on makeup and skincare photos. But I want to add more outfit posts to Nina's Style Blog and I guess, if I continue taking outfit photos, I will get used to, one day.. These olive leggings are the comfiest leggings I own at the moment, I have bought them last year but I couldn't fit in until now. Yes, it often happens to me that I buy something that doens't fit me at the time but I try my best to fit in, one day, just like these leggings. For me, comfy outfit doesn't necessarily mean that I have to wear flats or sneakers, I can definitely walk in high heels all day, as long as the shoes fit right on my feet, like these black mules. Those leggings are perfect for fall! Thanks dear. They are really comfy. Love this casual chic look Nina! Those shoes are fabulous. I really like this outfit post! The olive color of the leggings is lovely, and I like how you styled them with the mules. Love so much these mules. They look amazing and so comfy! This is simply chic babe. you look lovely in this outfit and those mules are perfect! The leggings look great on you Nina and are perfect for Autumn. Love your shoes Nina, gorgeous shape! thats a cute purse! great look! I love this look Nina. Yes outfit posts are not the easy at times. As you know my shoot in Paris did not go particularly well. Your photos came out great though this is an great casual look for running around town. Loving this cute combo! So chic! Loving this whole look Nina! You look fab! Those black mules are gorgeous! love the color combo of olive and black! Such a cool outfit! I like these shoes! I like your looks and those leggings are adorable! Cute outfit! Love the leggings! My kind of casual comfort outfit here. You look wonderful Nina. Nice bag! Leggings are one of the comfiest items! You look fabulous in that look. This is a great look. A black tee paired with olive leggings is a lovely outfit idea. Perfect for transitioning. Cute bag and shoes as well. YOu look lovely. your outfit looks very comfy, a perfect laid back. Cool and relaxed look with the olive leggings! Lovely look dear. 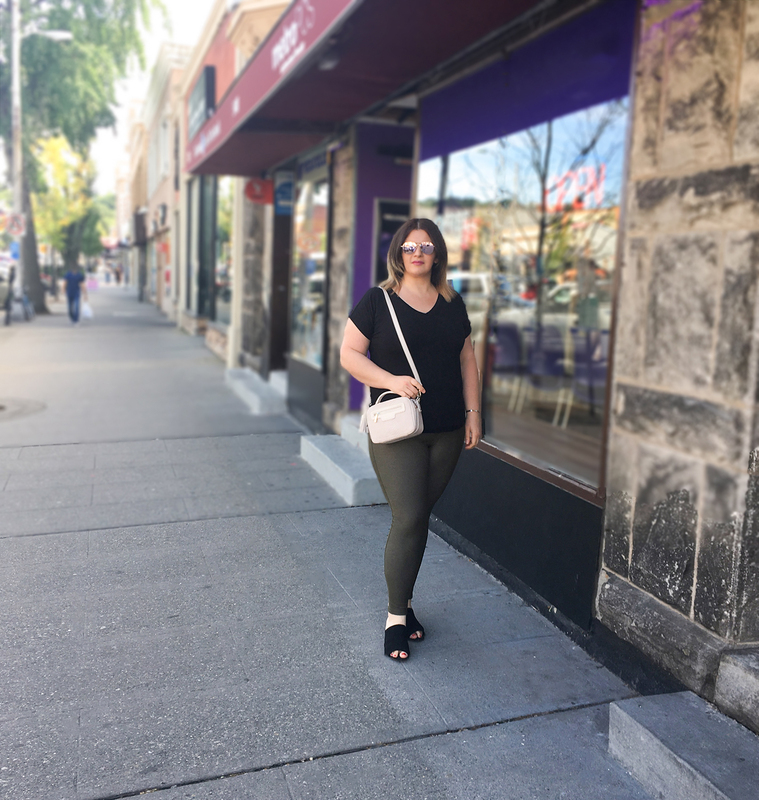 The olive leggings fits you perfectly. Love the pop of color from the bag too. You look gorgeous in this outfit! The leggings are perfect for this time of year. It’s so hard to feel comfortable in front of the camera so I know how you feel! and that purse is soo cute :D! I love your shoes my dear. I really like your mules and completely agree with you that you don't need be in sneakers or flats for comfy outfit. Loving the tight leggings! Beautiful outfit! I love those black mules! Such a casual and comfy outfit my dear! Thanks for sharing! I love this fall color combo!